I just got the following email from Monica O’Rourke of the Horror Writers Association announcing this year’s recipients of the Lifetime Achievement Award. My hearty congratulations go out to Ellen Datlow and Al Feldstein. The Horror Writers Association has chosen two long-time icons of the genre to receive the prestigious Lifetime Achievement Award this year. The award, given in recognition of the recipient’s overall body of work, will go to Ellen Datlow and to Al Feldstein. To learn more about this year’s winners, visit them online at www.datlow.com and www.alfeldstein.com. The Lifetime Achievement Award is the most prestigious of the Bram Stoker Awards, given by the HWA in acknowledgment of superior achievement not just in a single work but over an entire career. Past Lifetime Achievement Award winners include such noted authors as Stephen King, Anne Rice, Joyce Carol Oates, Ray Bradbury, F. Paul Wilson, Chelsea Quinn Yarbro, Brian Lumley, William F. Nolan, and Peter Straub. Winners must have exhibited a profound, positive impact on the fields of horror and dark fantasy and be at least sixty years of age or have been published for a minimum of thirty-five years. The Horror Writers Association is a worldwide organization promoting dark literature and its creators. Started in 1985, it has more than five hundred members who are writing professionally in fiction, nonfiction, videogames, films, comics, and other media. * The Stoker Weekend and the awards banquet are open to the public. For more information about the HWA, the Bram Stoker Awards, or the Lifetime Achievement Awards, please visit www.horror.org. Joe McKinney: I don’t do many interviews here at Old Major’s Dream, but I had to make an exception for today’s guest, the iron man of modern horror, Eric S. Brown. Eric, thanks so much for being with us here today. Eric S. Brown: Thanks Joe. It’s great to have this chance to talk with you. JM: Let’s ease into this, Eric. Today, you’re an extremely prolific author known for countless books, novellas and short stories. Your zombie tales, literary mash ups, Bigfoot novels, and superhero stories are all deservedly respected and admired. But how did you get to this point? Give us a little biography. ESB: I grew up in rural North Carolina. Both of my parents were “drop-outs” and I was the black sheep of the family for attending college. I spent my youth going to the comic shop six days a week (they were closed on Sundays), reading David Drake and Lovecraft, and watching every horror film I could get my hands on. I always knew I wanted to be a writer but it wasn’t until I was 26 and married that my wife finally made me start submitting. My first story out was accepted by two publications. I gave it to one and wrote a second tale for the other. Things just kept rolling from there. JM: I guess it comes down to creative energy, right? The mind is restless and so it creates. So was horror always the natural outlet for your creative energies? Have you ever flirted with other genres? ESB: I have written a bit of everything from Fantasy (Shhh…don’t tell anyone), Military SF, Superhero stuff, and more but horror was and still is my first love. When I started out, I wanted to be the next “David Drake” but as much as I love Military SF, truth be told, I just write horror better. What about you Joe? Have you tried your hand at other genres? Do you have a military epic lurking within you? JM: Maybe not a military one, but definitely something along those lines. While I’m still doing a lot with horror, more and more of my attention is shifting toward the mainstream thriller market. But no matter how far I roam, horror will always be close to my heart. Like you, it’s my first love. So what is it about horror in particular that clicks with you? I know, for me, the draw has always been horror’s ability to pull in so many other kinds of genres, and yet still maintain its overall reason for being. After all, a horror story that utilizes the conventions of the romance genre, or crime genre, or adventure tale, is still, through and through, a horror tale. ESB: I love end of the world stories and struggles against overwhelming odds. That’s your typical Z apocalypse totally so I guess that is why I have written so many zombie books and stories. I also like horror because it can be just about anything. My books How the West Went to Hell and The Weaponer mix it with Louis L’amour type stuff. My book Kinberra Down mixes it with not only SF but BlackHawk Down style action. And of course, my books The Human Experiment and Anti-Heroes (with David Dunwoody) show that not even superheroes are safe from the darkness. JM: I mentioned earlier that you write a great many kinds of horror, but you got your start with zombies, right? ESB: I did. My very story that got sold was a Z tale. You can find a lot of my early Z stories collected in Unbridged, Unabashed, and Undead: The Best of Eric S Brown. Today though, I have left zombies behind a bit and am exploring the monster that truly frightened me in my youth: Bigfoot. Growing up in the super rural south, I was terrified of him. If you read my book Bigfoot War, which most folks say is the best book I have done to date, you can really see me come alive as a writer again and feel the passion I put into it. JM: As the body of your zombie work started to build, did it ever worry you that you might be pigeon-holed as just a zombie writer? I know I have had fears of being thought of as a one-trick pony, despite the fact that I write in wide range of genres. JM: So, we both have zombies to thank for our success, I guess. But I read somewhere that you simply hate the Haitian voodoo zombie. Say it isn’t so. ESB: Yes, it is. Sorry Joe. I am just NOT a magic kind of guy. I am more of science freak. I love layman physics and theories. Anyway, Haitian zombies just don’t have the whole APOCALYPSE effect that made me love zombies in the first place. To me, if the world isn’t dying, it likely isn’t a zombie story. JM: So a good (and by good I mean scary) zombie is what? 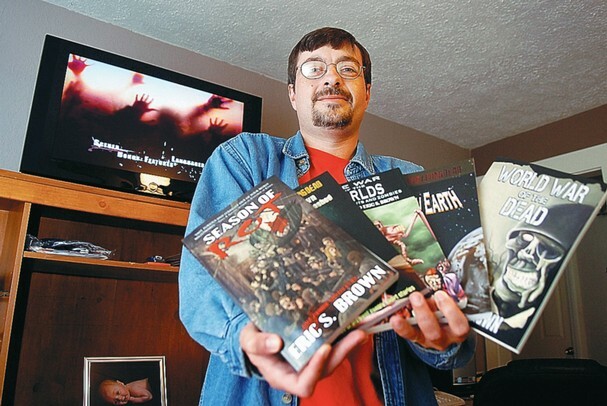 When Eric S. Brown says “zombie,” what picture does he put to the word in his mind? ESB: A howling, fast, hungry monster who wants to tear you apart and eat you alive. That’s a zombie to me. JM: Okay, let’s change gears here for a second. I want to get academic on you for a bit. From Washington Irving’s “The Legend of Sleepy Hollow” and “Rip Van Winkle,” both written shortly after the American Revolution and dealing on a very personal level with what it means to be an American, to the alien invasion B movies of the ‘50s and their commentary on the creeping threat of Communism, horror has traditionally been a fairly accurate barometer of the American psyche. Today, we have a flood of zombie stories on the market, not to mention a related host of post-apocalyptic stories and first person shooter video games. What do you think the zombies and his apocalyptic cousins are trying to tell us about modern America? ESB: It’s the end of the world? I don’t really know. I have never claimed to be a “thinker” or “literary.” For me, writing is a way to get folks to have fun and a way to give back to the genre I love as a fan. ESB: Perhaps. We live in a very unstable world with bad stuff on the news every evening. Our culture seems flooded with darkness. Maybe it’s just because we’re all so much more in touch now with all the tech and we hear about so much more evil and horror in the real world but yeah, I would say we can all sense something rather not good coming. JM: You’ve had several big successes recently, but I think my favorite project of yours has to be the Bigfoot War trilogy. I remember as a kid watching Leonard Nimoy’s series In Search of… and being scared to death by the Bigfoot episode. What got you interested in Bigfoot? ESB: I grew up in the south and as a kid I had this huge woods behind my house above my dad’s garden. It was creepy as Hades. Before I was even in the first grade I was hooked on horror and reading/watching everything I could so of course I stumbled onto Bigfoot. Bigfoot just seemed so real and there was real evidence that something like the monster in those stories could exist. I used to have nightmares the beast came out of the woods and stood at my bedroom window just waiting for the right moment to break inside and tear me to shreds. JM: As I mentioned, you have plans to turn Bigfoot War into a trilogy, and from the looks of the reviews on Amazon, quite a successful one. Can you walk us through the series? Tell us a little about it. What kind of feel were you going for? ESB: Yep. You have book one (Bigfoot War) which is my love song to all things B movie and Bigfoot in nature. It’s that Bigfoot movie you always wanted to see that never got made where an entire pack of the things come tearing out of the woods and into the streets killing folks. Book two (Dead in the Woods) tells the story of the end of the world via zombie pandemic mixed with the same kind of heart-pounding, breathless action of the first book. And I am currently at work on Book three which I think will shock a lot of folks in terms of the genres it mixes. JM: You’re actually still building on the success of your recent Bigfoot encounter with an upcoming anthology. Tell us about that project. ESB: Bigfoot Among Us is a collection of Bigfoot horror tales that will come out from Coscom Entertainment later this year. It’s going to be a wild, fun romp through a lot original takes on Sasquatch horror. As one of the writers included in that anthology what was it like for you to write a Sasqautch horror tale Joe? JM: I loved doing it. Like you, I went back to my love of classic horror movies and told my Bigfoot tale in the context of John Carpenter’s legendary film, The Thing. It was a great experience writing that. But hey, let’s talk about the fate of modern publishing for a bit, as that’s a topic near and dear to both our hearts. We seem to be standing on the frontline of a publishing revolution. With the surge in self-publishing, and the demise of a few of the large brick and mortar booksellers, like Borders, and the rocky climate for the traditional publishing model established by the big New York houses, writers these days seem to have a lot of viable options to sell their stuff, but little assurance that they will reach a significantly large audience. What do you think the future will hold for Eric S. Brown? ESB: I can only keep my insane work ethic, chase the dream, and hope for the best like anyone else. Seeing Bigfoot War made into a film someday is my main dream as I wrote it to be movie. Beyond that, I am just grateful for all that God’s blessed me with already. Nine years ago, I never thought I would be with Simon and Schuster or hang out with guys who write for Marvel Comics and call them friends but I am and I do. That’s a dream come true anyway you look at it. JM: Thanks for joining me here at Old Major’s Dream, Eric. Hope you had a good time. I know I did. ESB: Thanks for having me on Joe. It was a pleasure as always to talk to you.